It's no surprise to the people that know me that white flowers are my favorite. Though I have liked many other colors in the past. For a time I loved all the jewel tone colors...deep purples, cranberry,deep orange since it looks so good against our dark green painted house. To be honest I've liked and experimented with all colors of flowers for myself at home. But I seem to come back to white every couple of years. I just never tire of it. Maybe it's because I'm surrounded by color all day long that I enjoy the simplicity of it. I guess I'm borrowing that thought from interior decorators who often have white interiors for themselves so they can be home and not always be over thinking their space. Or is that over simplifying it? What are your favorite colors???? and why? 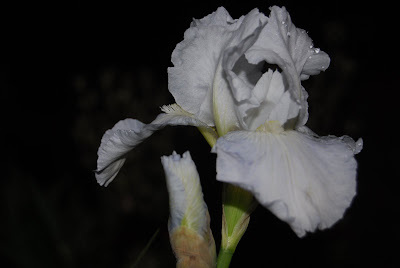 White Irises are one of my favorite flowers. Fleur de lis as the french call them. I wish I knew what the symbolism was in ancient french courts and why they used it? 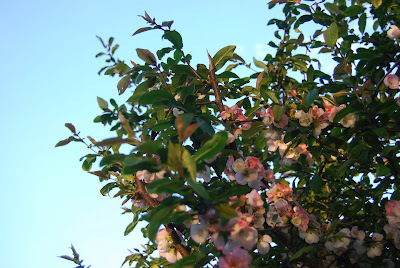 I found a poem the other day that reveals the reason they may have used this magficent flower. See what you think? This is a new bacopa we tried this year. 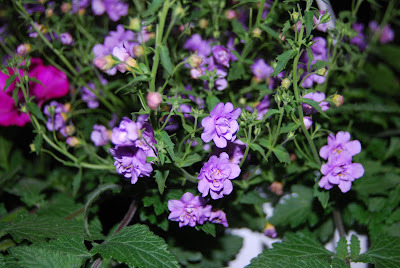 Double blue...sorry I don't remember the breeder or exact name...not that I think you need the botanical name I'm sure if you asked for double bacopa they'd know what you meant. It also comes in white. 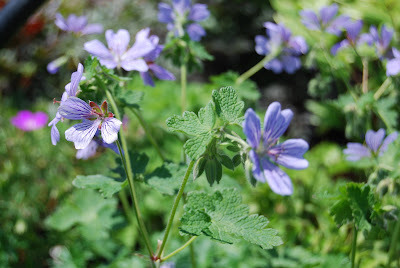 Geranium " Stephanie" I think??? Gee I'm not being to good on the names am I??? I like this one because it has that airy look without looking too rangy like some of them do. 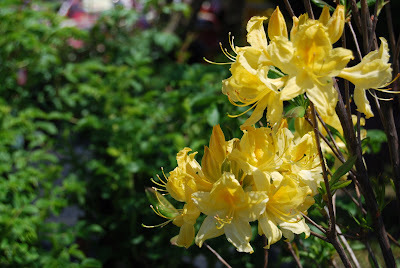 Though my favorite is Rozanne which has the longest bloom time of any I've ever seem and looks great in the garden but unfortunately doesn't look so great in a pot and is often a hard sell. 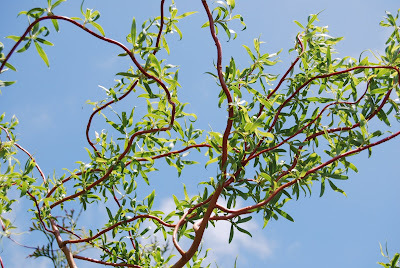 Salix matsudana " Corkscrew Willow"
I love this plant. 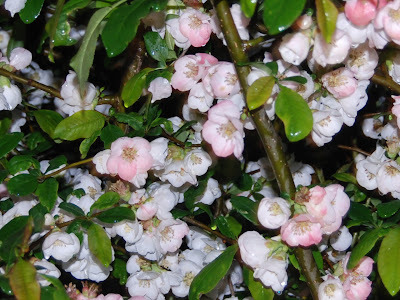 I might find a spot to plant this one myself just so I can cut the branches for flower arrangements. 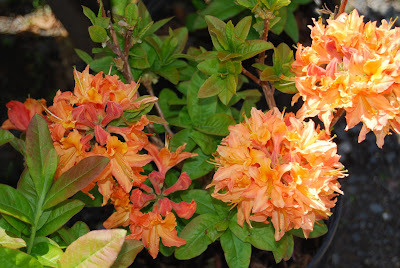 Deciduous azalea usually flowers before it leafs out all the way. Isn't that color spectacular? 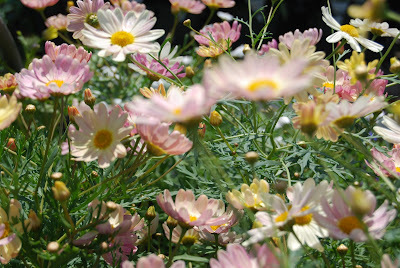 It flowers in different shades of pink and light yellow. 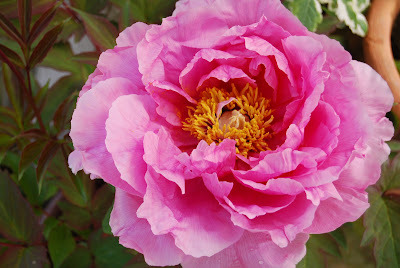 Tree peony in pink....now this I buy without any specific name like Nishiki or some Japanese name so I can't even tell you it's exact name but it's the biggest blossom I've ever seen on a tree peony before, the thing must have been 8" wide at least. I say had because it sold. I knew I'd better take a picture of it quick because it wasn't going stick around long. 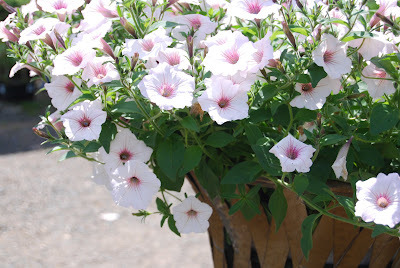 I love this new supertunia called silverberry....not as popular as I'd hoped for my "it's got to show from the road" customers. I get that a lot.....????? Why is that so important???? OK don't get me started!!!! 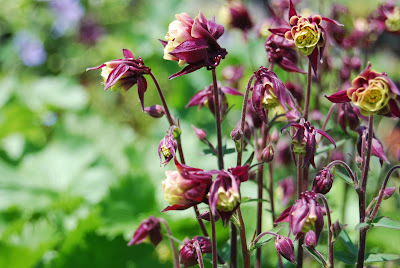 Columbine Double something???? I guess I could go out there and look it up... but does it really matter??? 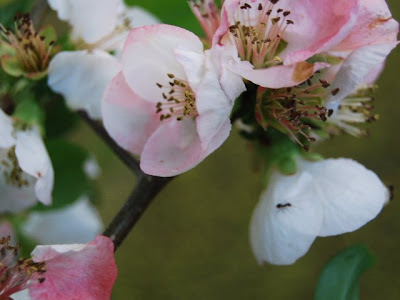 I've seen other double ones before but is one has petite flowers that you can't really tell from here but just makes it look very dainty as it sways in the wind. One of my favorite customers Gretchen( on the left) and her friend Gina. She'd kill me if she thought I'd taken this picture of her but I don't think she'll ever know. Shhhhh!!!! Sometime I'll have to show you her house in Lyme, Ct. It's a new version of an old barn that is absolutely gorgeous and has been photographed for magazines a couple of times. She has great taste and is one of the most fun people I've ever known and never takes herself too seriously. 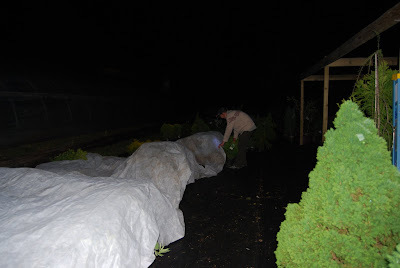 Last night there was a frost alert and we spent the night covering some tender shrubs and annuals. Being along the shore our risk was a little less but we didn't want to chance it. This morning I noticed even the things we covered looked a bit touched but all in all we were very lucky. On a funnier note. This was on our caller ID. 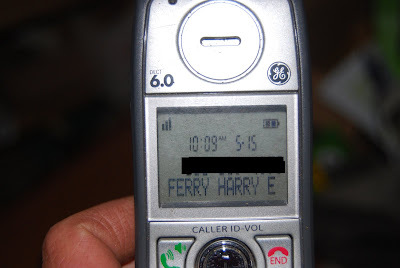 I know it's not nice to make fun of peoples names, but who would name their child Harry Ferry!!! I told you I was getting punchy!!! I always enjoy visiting my friend Delores. We have so much in common and I just love her taste. 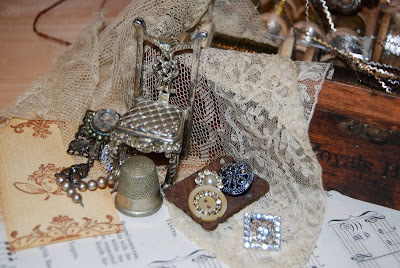 We both love old vintage things, buttons, ephemera ...well you know the girly things we all love. A few years ago she and her husband built a shed for her to store her ever increasing collection of stamps, papers and ribbons. It's so well organized and even though it's not all that big she actually has a great work table and a lot more room to create than I have, and I have a whole room. Ahhhh to be organized ....what a concept. Maybe someday??? 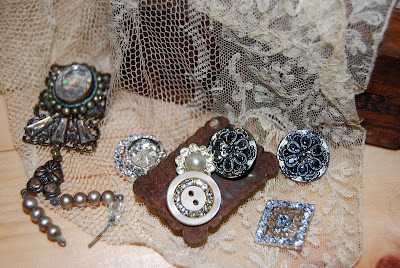 We started playing with some of her vintage buttons and ribbons. 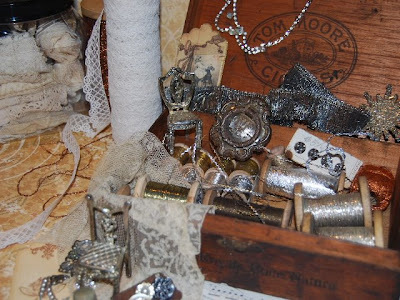 She pulled out a old wooden cigar box full of her silver tinsel .....some from Tinsel Trading in NYC onces called The French Tinsel Co.~one of our favorite shops. 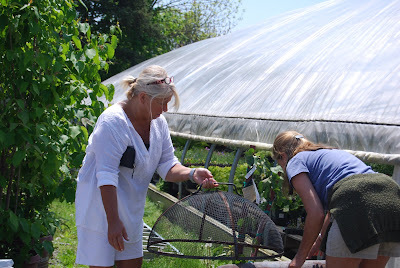 Some are from Brimfield which she tries to go to at least once a year. This was a little gift tag she'd been working on. She had just figured out how to work her Photoshop program to position an image on to a page. Seemed pretty neat but beyond my skills. We're both button collectors but she's the bling-bling girl. She uses them when making cards but I love them on just about everything. We can spend hours shopping for buttons. 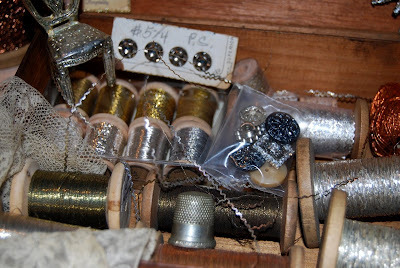 The old silver tinsel years ago was used for elaborate costumes~ mostly military uniforms. Now we use them for creating beautiful art projects and crafts. 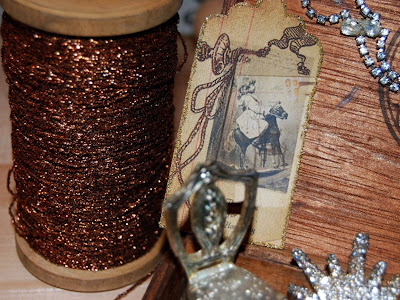 Don't you just love the old spools??? She had just made this and my eyes went right to it when I came in the house. I love it under the glass dome. 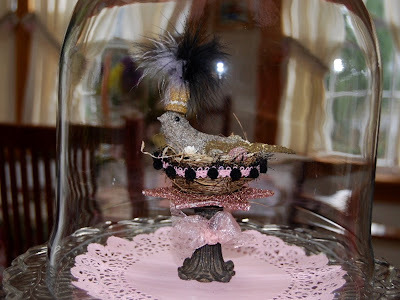 Looks so sweet with the feathers on top of the birdy's hat. Her house is full of unique pieces ...many from her Mom who handpainted on porcelain...That'll be a post for another time. I feel lucky to have such a sweet and talented friend. 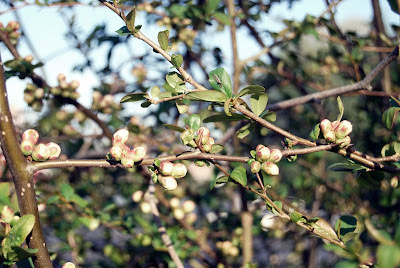 I said to my husband the other day "I wonder if the Quince is flowering"....he said "yes I told you it was and you'd better hurry and see it or you'll miss it". I thought Oh my goodness I'm going to miss it again. 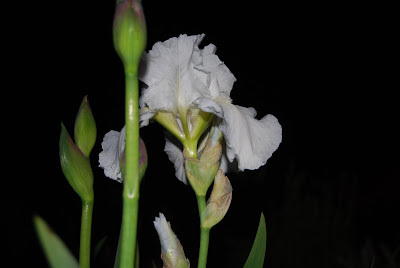 So I went out in the dark with my flashlight and camera in hand. It had been raining most of the day but had stopped a few hours before. 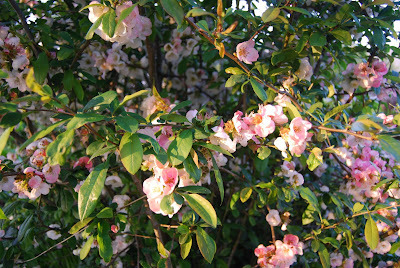 and this is it in full bloom. You can see the leaves glistening in the light. 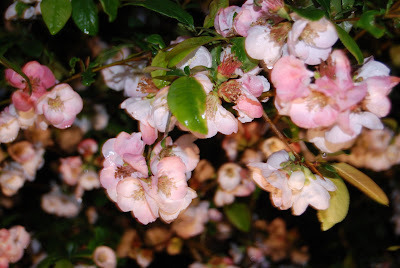 I was so happy to see the rain hadn't knocked any of the blossoms off. The next day I decided I should see it in the daylight... though it was early evening the sun was still out. It was even prettier than the previous night. 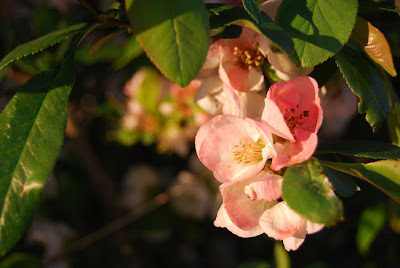 I think one year it had gotten a few quince that matured on it but you can't do much with them....the flowers are the reason to grow this plant. ......And I'm so happy we did. 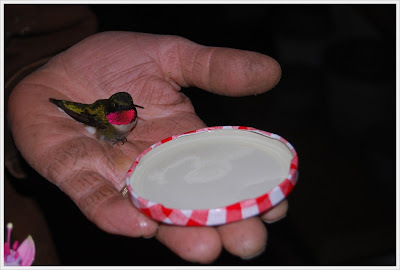 Ok, I know you may not believe me but this happens alot around here....my husband George catching or should I say rescuing hummingbirds from our greenhouses. 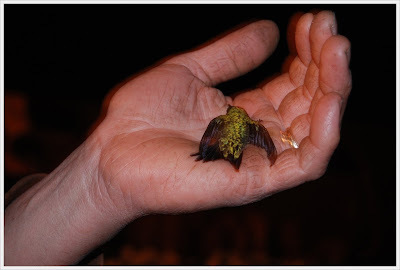 This time it was a little different in that this little guy or gal (how Do you tell the difference???) actually fell into his hands from sheer exhaustion. 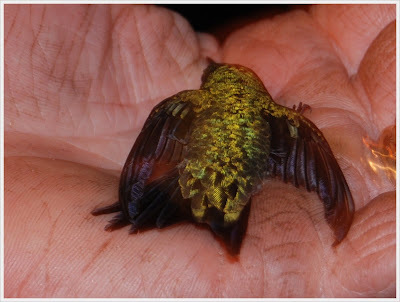 The hummingbird had been trying to figure out how to get out and ended up at the very peak where it gets extrememly hot. It's happened so many times in the past I've lost count. He laid there lifeless for what seemed like forever so I ran to get some sugar water. 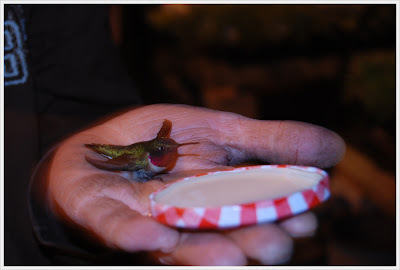 He wouldn't drink out of the dish by himself so George used his fingers to drip water on his beak. He slowly started to drink and came back to life before our eyes. Normally when he catches them they never look this bad. They usually at least sit up. This one was completely pooped out. 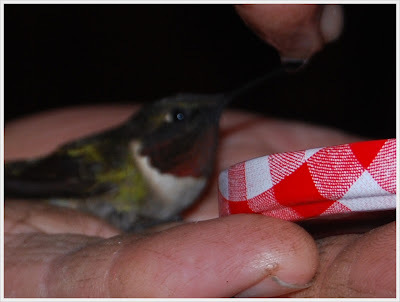 He rested on his hand while I tried to keep the cats away that were starting to gather around us. Though I think they weren't even aware of him. Well, that was our excitement for the evening. It was a good thing we were working late or it may have had a different ending for the poor little thing. They are such amazing creatures. I feel privilege that we get to be around them all the time....one of the perks I guess.